The Outpost Sign was erected during the roaring 20s in neon letters 30 feet high to publicize a new housing development called the Hillside Homes of Happiness. According to KCET this artifact was once the largest neon sign in America created by hard working pioneers who believed in the American Dream.The Outpost Sign was erected to outshine the "Hollywoodland" sign, but because of World War II it was dismantled in fear the lights would attract enemy bombers. "The Outpost" was the name of the adobe of the Los Angeles Times publisher General Harrison Gray Otis, also a decorated Civil War Veteran that once owned the land. 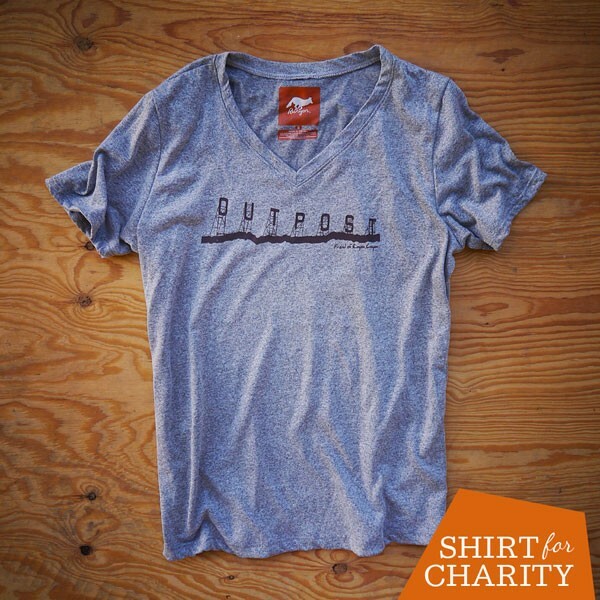 Read more at KCET and Outpost Estates.We're super excited to offer this historic shirt on Runyon Signature Fitness Shirt and a Tank Top. Educate the masses and help a great cause while you rock it at the gym or your next outdoor adventure.ThE CHARITYFriends of Runyon Canyon is the non-profit organization that works with the City of Los Angeles to help to restore, manage and enhance the Runyon Canyon Park Recreation Area for the enjoyment of present and future generations. Proceeds from the sale of this shirt will go directly to Friends of Runyon Canyon.To learn more about Friends of Runyon Canyon or to make a direct charitable contribution, click here.